In Mickey's Christmas Carol, Scrooge has a lion-faced knocker again. Dickens doesn't describe it that way (or at all, except for its being large), so I did some quick Googling to try to find the first instance where it's depicted as lion-shaped. I didn't have any luck, except to find this cool Brief History of Door Knockers that explains that lions were an incredibly popular shape to put a knocker in. They symbolize strength and honor and they just look darn cool. There's even one on the Prime Minister's house at 10 Downing Street. So this might not be a case of everyone's imitating a particular illustration or movie depiction of Scrooge's knocker. Could just be everyone having similar ideas about what the knocker might have looked like and what's most visually impressive. Something else visually impressive is ignoring Dickens' "no intermediate process of change" and having the knocker morph into Marley's face. That's what Mickey's does and it looks great. Scrooge also gets to interact with Marley a little here. Marley moans Scrooge's name which leads Scrooge to test his senses by tweaking Marley's nose. Since Marley is played by Goofy, there's plenty of room for silliness. I'll talk in a minute about whether that's a good thing. 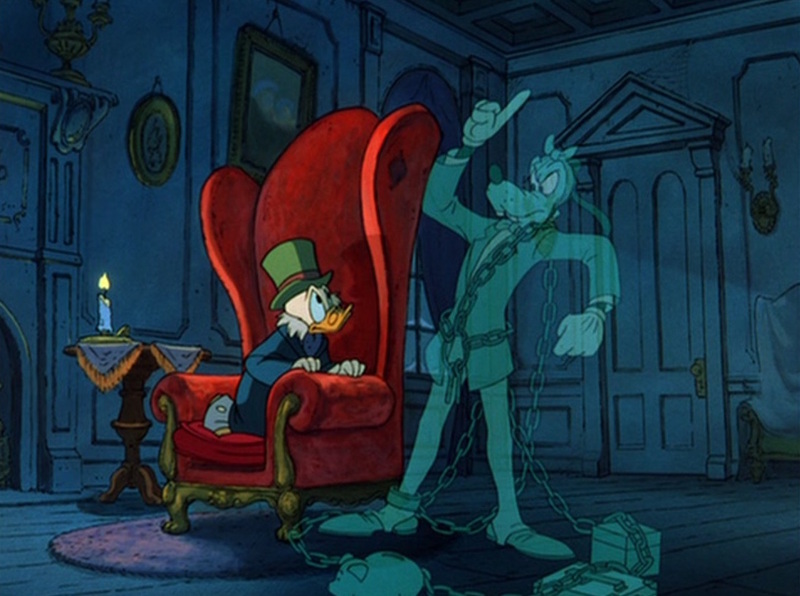 Scrooge is a little freaked out by the encounter and rushes inside, but he decides it was his imagination. There's no hearse on the stairs - in fact, the stairs are narrow and creaky in keeping with Scrooge's miserliness - but Marley's shadow follows Scrooge up with some more interaction. It's a pretty funny bit with Marley trying to be sneaky, but his clanking chains give him away. So Scrooge turns to look and Marley disappears, then reappears to mess with Scrooge some more when Scrooge continues walking. Scrooge is getting concerned now and rushes into his room where he bolts the door. No simple double-lock for this version; Scrooge has six locks. Since Marley's following Scrooge, there's no time for searching the apartment or fixing gruel. Scrooge keeps his coat and hat and hides in a big chair, but Marley comes on through the locked door. He's wearing the bandage (never takes it off though) and is blue and transparent. Scrooge shivers and quakes comically. None of this is supposed to be actually scary and Marley is even a little hurt that Scrooge is afraid of him. "Don't you recognize me?" he asks. And that calms Scrooge down enough to have a conversation with his old friend, ghost or no ghost. There's no debate about Scrooge's senses. Right away, Scrooge is a believer. The conversation is weird though, tonally. The problem with having Goofy play Marley - and this casting is the weakest thing about this version - is that he's so likable. It's hard to imagine Goofy doing all the horrible things he and Scrooge talk about. The dialogue even struggles with it, having Marley humorously proud of robbing widows and swindling the poor, then remembering that he's supposed to be sorry about it. It's not really sure how to play Marley, so it goes both ways. Scrooge is consistent though. This version is a playful, happy miser. When Marley throws his chains and cash boxes (and a piggy bank) at Scrooge for emphasis, Scrooge picks up the bank and jiggles it, wondering how to get at the coins inside. But he's appropriately horrified by the thought that he'll have to share Marley's fate and he's immediately willing to change. When Marley predicts the coming spirits ("tonight," he says, so all in the same evening), Scrooge nods silently. He's not excited about it, but he's compliant. There's no host of phantoms outside in this economical telling. Marley simply leaves the way he came in, by materializing back through the door. And tripping on a step on the way down. That Goofy. Yeah, I agree with you on the casting. I mean Scrooge McDuck was born to play, well Scrooge. But the Marley casting might have been better had it been given to Pete, the nemesis to Goofy and many other Disney characters. We know he is usually a bad dude, so he would have worked better.